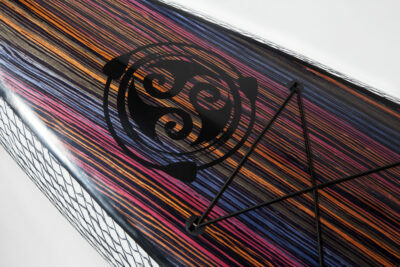 Upgrade to one of our carbon and exotic wood paddles. At 12’6″ x 26.75″, the Jimbo board is a combination of technology and classic looks. The zebra wood compliments the carbon/kevlar construction. Vacuum bagging compacts the fiber layers and produces a board that feels both solid and highly accurate under your feet. With a very slight nose and tail rocker for open water efficiency and flat water speed. This board tracks straight and offers both stability and maximum velocity. With a displacement bow and increased nose volume it pierces the water and planes over bumps for longer glides. With a flat deck for easy maneuvering and a square tail for clean release while offering turning stability. With many podium finishes to its credit, this board will get you to the finish quickly while still offering the looks and durability you have come to expect from Three Brothers. Be the first to know about sales, news, and more.